Hawaiian anthropological documentary Aloha From Lavaland is scheduled to be released on Amazon and iTunes on Nov. 15, 2017. The film follows the aftermath of the 2014 eruption of Hawai‘i’s Kilauea volcano, which sent a flow of lava directly toward the center of Pahoa, a small rural town on Hawai‘i Island. Hard to predict and impossible to stop, the flow threatened to cut off the town’s only access road, leaving the residents of this remote community to rely heavily on one another as they prepare for possible isolation. Produced in conjunction with Gift Culture Media, Larkin Pictures and Pure Mother Love, this 55 minute documentary explores an inner community perspective of the lava flow, following residents as they ask and answer important questions about community, sustainability, harmony, and what it really means to live in such an unpredictable paradise. Aloha from Lavaland premiered at the Hawai‘i International Film Festival and has won three awards including Best Hawai‘i Film at the Honolulu Film Awards. To view the Aloha from Lavaland trailer, click here. You can also learn more about the film online. On Wednesday evening (September 7), the lava lake at Kīlauea’s summit reached a high level, about 8 m (26 feet) below the floor of Halemaʻumaʻu Crater. This panorama shows the former Halemaʻumaʻu Overlook (closed since 2008 due to volcanic hazards) at the far left. Jaggar Museum, visible on the skyline in the upper right part of the photo, is a popular destination in Hawaiʻi Volcanoes National Park for viewing the lava lake activity and spattering lake surface. A closer look at Kīlauea’s summit lava lake on Wednesday evening, around 6:30 p.m., when the lake was just 8 meters (26 feet) below the floor of Halemaʻumaʻu Crater. The view is to the southeast. Puʻu ʻŌʻō is at upper right. View of recent breakout on east flank of Puʻu ʻŌʻō. The flow has advanced about 1.3 km (0.8 miles), but activity today was focused in the middle part of the flow, closer to its vent. The view is to the west. This photo, looking southwest, shows Puʻu ʻŌʻō in the background, with the northern breakout from May 24 extending to the right, with fume coming from a newly forming tube. The feature in the center foreground is a perched lava pond that formed in July 2014, but was refilled by new lava from the northern breakout in recent days. The breakout point of the eastern breakout is hard to pick out, if you don’t know what to look for. It’s the lighter colored lava at the left edge of the photo immediately below center. Puʻu ʻŌʻō’s current crater subsided by about 10 m (33 ft) in the days following the May 24 breakouts. This view, looking southeast, shows the crater as it was today. HVO webcams are perched on the edge of the Puʻu ʻŌʻō cone (an older crater rim) in the foreground. A close-up view of the spatter cone. The ground around the spatter cone was covered in small gobs of spatter and Pele’s hair, as shown here. A closer view of the skylight on the east breakout. The skylight is about 6 m (20 ft) across, and the lava stream is traveling toward the upper right side of the photo. An even closer view of the skylight (about 6 m or 20 ft across). Again, the lava stream is flowing to the upper right. Volcanoes have always fascinated Carolyn Parcheta. She remembers a pivotal moment watching a researcher take a lava sample on a science TV program video in 6th grade. “I said to myself, I’m going to do that some day,” said Parcheta, now a NASA postdoctoral fellow based at NASA’s Jet Propulsion Laboratory in Pasadena, California. Exploring volcanoes is risky business. That’s why Parcheta and her co-advisor, JPL robotics researcher Aaron Parness, are developing robots that can get into crevices where humans wouldn’t be able to go, gaining new insights about these wondrous geological features. 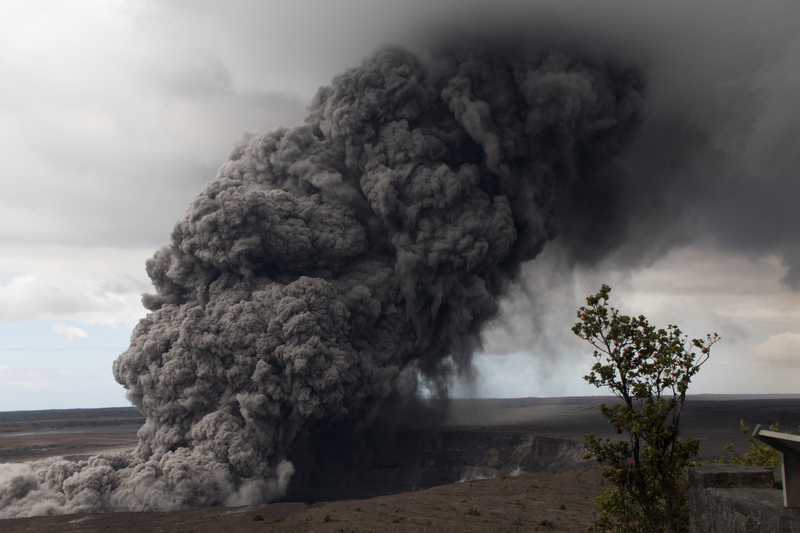 “We don’t know exactly how volcanoes erupt. We have models but they are all very, very simplified. This project aims to help make those models more realistic,” Parcheta said. Parcheta’s research endeavors were recently honored in National Geographic’s Expedition Granted campaign, which awards $50,000 to the next “great explorer.” Parcheta was a finalist, and was voted number 2 by online participants for her research proposal for exploring volcanoes with robots. “Having Carolyn in the lab has been a great opportunity for our robotics team to collaborate with someone focused on the geology. Scientists and engineers working together on such a small team is pretty rare, but has generated lots of great ideas because our perspectives on the problems are so different,” Parness said. The research has implications for extraterrestrial volcanoes. On both Earth and Mars, fissures are the most common physical features from which magma erupts. This is probably also true for the previously active volcanoes on the moon, Mercury, Enceladus and Europa, although the mechanism of volcanic eruption — whether past or present — on these other planetary bodies is unknown, Parcheta said. “In the last few years, NASA spacecraft have sent back incredible pictures of caves, fissures and what look like volcanic vents on Mars and the moon. We don’t have the technology yet to explore them, but they are so tantalizing! Working with Carolyn, we’re trying to bridge that gap using volcanoes here on Earth for practice. We’re learning about how volcanoes erupt here on Earth, too, and that has a lot of benefits in its own right,” Parness said. Parcheta, Parness, and JPL co-advisor Karl Mitchell first explored this idea last year using a two-wheeled robot they call VolcanoBot 1, with a length of 12 inches (30 centimeters) and 6.7-inch (17-centimeter) wheels. It is a spinoff of a different robot that Parness’s laboratory developed, the Durable Reconnaissance and Observation Platform (DROP). “We took that concept and redesigned it to work inside a volcano,” Parcheta said. For their experiments in May 2014, they had VolcanoBot 1 roll down a fissure – a crack that erupts magma – that is now inactive on the active Kilauea volcano in Hawaii. Finding preserved and accessible fissures is rare. VolcanoBot 1 was tasked with mapping the pathways of magma from May 5 to 9, 2014. It was able to descend to depths of 82 feet (25 meters) in two locations on the fissure, although it could have gone deeper with a longer tether, as the bottom was not reached on either descent. “In order to eventually understand how to predict eruptions and conduct hazard assessments, we need to understand how the magma is coming out of the ground. This is the first time we have been able to measure it directly, from the inside, to centimeter-scale accuracy,” Parcheta said. VolcanoBot 1 is enabling the researchers to put together a 3-D map of the fissure. They confirmed that bulges in the rock wall seen on the surface are also present deep in the ground, but the robot also found a surprise: The fissure did not appear to pinch shut, although VolcanoBot 1 didn’t reach the bottom. The researchers want to return to the site and go even deeper to investigate further. Specifically, Parcheta and Parness want to explore deeper inside Kilauea with a robot that has even stronger motors and electrical communications, so that more data can be sent back to the surface. They have responded to these challenges with the next iteration: VolcanoBot 2. VolcanoBot 2 is smaller and lighter than its predecessor, at a length of 10 inches (25 centimeters). Its vision center can tip up and down, with the ability to turn and look at features around it. “It has better mobility, stronger motors and smaller (5 inch, or 12 centimeter) wheels than the VolcanoBot 1. We’ve decreased the amount of cords that come up to the surface when it’s in a volcano,” Parcheta said. While VolcanoBot 1 sent data to the surface directly from inside the fissure, data will be stored onboard VolcanoBot 2. VolcanoBot 2 has an electrical connection that is more secure and robust so that researchers can use the 3-D sensor’s live video feed to navigate. The team plans to test VolcanoBot 2 at Kilauea in early March. The California Institute of Technology manages JPL for NASA. 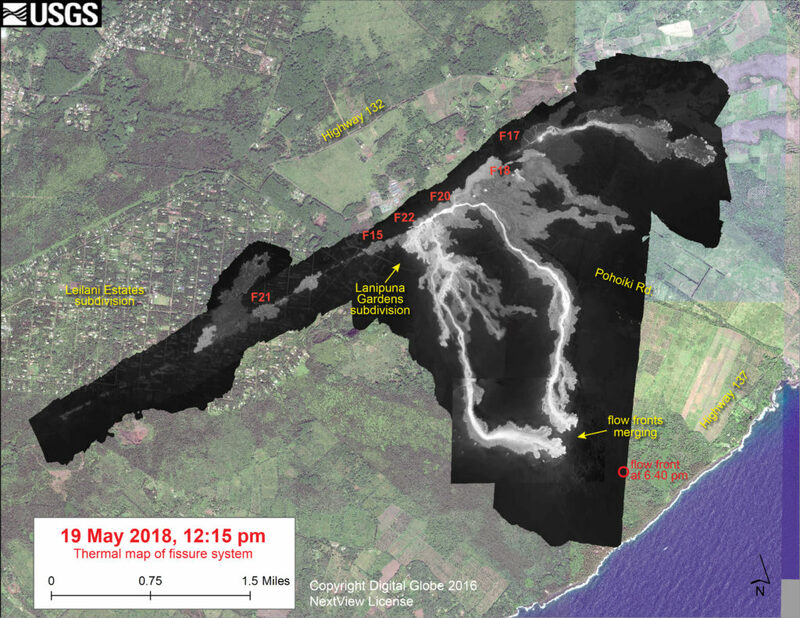 The Kahaualeʻa 2 flow has been advancing through forest northeast of Puʻu ʻŌʻō for the past several months, but last week deflation at the summit of Kīlauea led to a reduction in lava supply and a shutdown to the flow front as active breakouts diminished. Over the past week summit inflation has returned, and new breakouts have appeared on the flow, but well behind the former flow front. Because the active breakouts at the flow margin have shut down, there was little smoke from forest fires today. If the new breakouts continue to advance they will expand the Kahaualeʻa 2 into the forest once again and fires will resume. This thermal image shows the front of the Kahaualeʻa 2 flow. Summit deflation a week ago caused a reduction in lava supply to the flow and the flow front stalled, and is now inactive. Over the past few days, resumed summit inflation has driven new breakouts (shown by white and yellow colors) on the flow that are behind the stalled flow front. The vent for the Kahaualeʻa 2 flow is on Puʻu ʻŌʻō, marked in the upper left. Compare this thermal image to the visual image above. Top: This Quicktime movie shows a lava pond, about 15 m (50 ft) in diameter, on the east rim of Puʻu ʻŌʻō. Several small spatter sources are active on the pond margin, and release gas from within the pond. Lava pond activity like this is common in Puʻu ʻŌʻō. Bottom: This Quicktime movie shows weak gas pistoning in the lava pond on the east rim of Puʻu ʻŌʻō. Gas pistoning is the cyclic buildup and release of gas within the pond, and is common in Puʻu ʻŌʻō. This Quicktime movie shows some of the spattering associated with the gas pistoning, in which the spattering acts as an outlet for gas accumulating in the pond. Note how the crust in the center of the pond is fluctuating. Lava pond activity and gas pistoning are common in Puʻu ʻŌʻō. This thermal image shows the lava pond on the east rim of Puʻu ʻŌʻō from above. The temperature scale is in degrees Celsius. The pond is nearly circular, and has surface crust temperatures between 300 and 400 C (570-750 Fahrenheit – orange colors). The two spatter sources on the pond margin expose fresh, incandescent lava which has temperatures around 1100 C (2000 F) – well above the limit of the camera at this setting (which is 550 C, or 1020 F). Top: View of Puʻu ʻŌʻō crater, looking northeast. In the upper left, a line of fume sources marks the path of the lava tube feeding the Kahaualeʻa 2 flow. Bottom: Closer view of the northeast spatter cone on the east rim of Puʻu ʻŌʻō. Deflation last week resulted in the top of this small cone to collapse, and with resumed inflation a lava pond has filled the new pit. The northeast spatter cone is also the vent area for the Kahaualeʻa 2 lava flow, and the path of the lava tube is marked by the two incandescent skylights. The lava pond at the northeast cone had several spatter sources active on the pond margin, throwing spatter to a height of a few meters (yards). 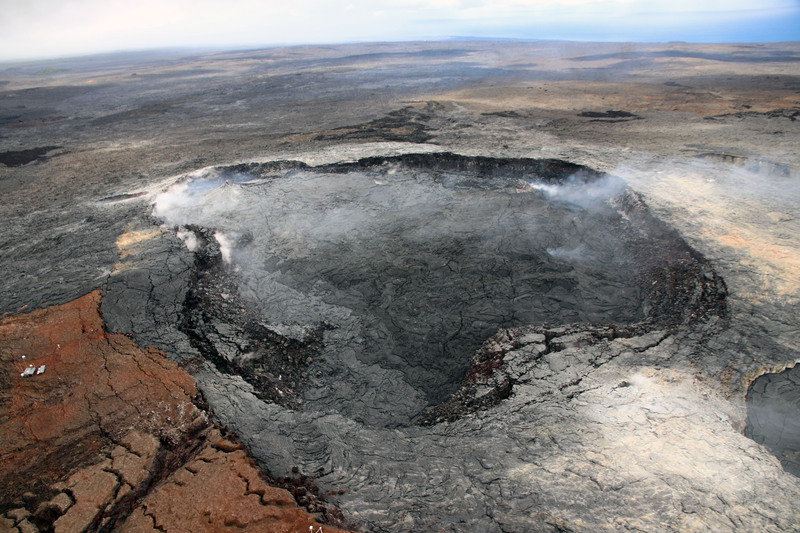 Top: A clear view of the lava pond at the northeast cone, on the east rim of Puʻu ʻŌʻō. View is towards the northeast. Several small spatter sources are active on the pond margin. Bottom: Several other spatter cones were active in Puʻu ʻŌʻō crater today, producing loud jetting and hissing sounds as gas is forced through narrow incandescent openings. The summit lava lake in Halemaʻumaʻu Crater dropped slightly last week in response to summit deflation, but has returned to higher levels with resumed inflation. Fluctuations like this have been common during the summit eruption. The lake is currently at a level that has been typical for the past year. The Kahaualeʻa 2 flow continues to slowly move through the forest northeast of Puʻu ʻŌʻō. Yesterday, the active flow front was 6.3 km (3.9 miles) northeast of the vent on Puʻu ʻŌʻō. Puʻu ʻŌʻō is just left of the center of the photograph in the distance, partially obscured by the smoke. A closer view of the active flows at the forest boundary, and the numerous plumes of smoke resulting from active lava igniting ʻōhiʻa trees and other vegetation. This thermal image, taken from the helicopter on today’s overflight, shows the area of active pāhoehoe near the flow front of the Kahaualeʻa 2 flow, northeast of Puʻu ʻŌʻō. Blue and purple areas show warm but inactive areas of the flow, while the white and yellow areas are actively flowing lava. The flow surface consists of numerous scattered pāhoehoe lobes, and the advancement of the flow as a whole results from the combined, incremental movement of these individual lobes. The summit lava lake is contained within the Overlook crater, which is about 160 m (520 ft) by 210 m (690 ft) in size, and set within the larger Halemaʻumaʻu Crater. A closer look at the summit lava lake. Two ocean entry points remain active near Kupapaʻu Point, near the boundary of Hawaiʻi Volcanoes National Park. The eastern entry has produced a larger plume than that at the western entry, which tends to be weak and wispy. Today several small breakouts were active just inland of the eastern entry point, creating a narrow cascade of lava pouring down the sea cliff. This photo looks south towards Puʻu ʻŌʻō, where a vent is supplying lava to the Kahaualeʻa II flow, north of the cone. This slow-moving flow has reached the forest line, producing small scattered brush fires. A close-up of the Kahaualeʻa II flow burning vegetation at the forest line, just north of Puʻu ʻŌʻō. The flow consists of numerous slow-moving pāhoehoe lobes. The summit eruption in Halemaʻumaʻu crater remains active. The lava lake is within the Overlook crater (the source of the gas plume), which is in the southeast portion of Halemaʻumaʻu Crater. After a 12 km (7.5 mile) journey from the vent on Puʻu ʻŌʻō cone through a lava tube, lava pours into the ocean in narrow streams at one of the eastern entry points. Another entry point has two larger lava streams entering the water. The lava fragments due to cooling and disruption by the battering surf, and some of these pieces float on the water’s surface in front of the entry point (see lower left portion of photo). Over the past week this spatter cone on the floor of Puʻu ʻŌʻō crater has been the source of several large, but brief, lava flows on the crater floor. Today, the cone was producing pulsating gas jetting sounds. Kīlauea Volcano’s summit eruption within Halema‘uma‘u Crater marks its fifth year of continuous activity on Tues., Mar. 19. To commemorate this anniversary, rangers at Hawai‘i Volcanoes National Park will offer additional “Life on the Edge” talks at the Jaggar Museum observation deck, which overlooks the fuming, enlarging summit vent. The 20-minute talks, offered on Mar. 19 at 10 a.m., 11 a.m., noon, 2 p.m., 3:30 p.m. and 5 p.m., encompass the dramatic geological and mythological history of Halema‘uma‘u Crater. Kīlauea’s summit vent opened at 2:58 a.m., HST, on Mar. 19, 2008, when an explosive eruption created a gaping hole about 115 feet wide on the south wall of Halema‘uma‘u Crater. Nighttime glow from this hole suggested the presence of molten lava, but it wasn’t until six months later that a lake of roiling lava deep within the vent was definitively observed by U.S. Geological Survey Hawaiian Volcano Observatory (HVO) scientists. With the opening of the Halema‘uma‘u vent, already-high summit sulfur dioxide (SO2) gas emission rates increased even more, resulting in increased vog (volcanic air pollution) downwind. Although the summit SO2 emissions have declined since 2008, they are still averaging 800-1200 tonnes/day, creating hazardous conditions along closed sections of the park’s Crater Rim Drive and poor air quality farther downwind of the vent. Since 2008, rock collapses within the vent have enlarged its opening on the floor of Halema‘uma‘u Crater. 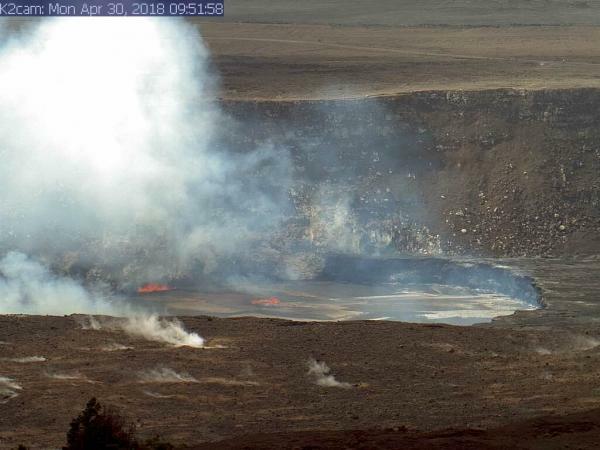 The vent is now about 520 feet by 700 feet (the area of about 21 Olympic-sized pools), and, according to HVO Scientist-in-Charge Jim Kauahikaua, is likely to continue growing through further collapses of overhung sections of the vent rim. Kīlauea Volcano’s summit vent “then and now.” In April 2008, a month after it opened, the vent within Halema‘uma‘u Crater was about 115 feet in diameter. As of March 2013, it is more than 500 feet across. USGS photos. Kauahikaua describes the lava within the vent as a continuously circulating gas-rich “foam” that rises and falls depending on changes in Kīlauea’s subsurface magma pressure. The lava lake reached its highest level to date on Oct. 26, 2012, when the lava surface rose to within 72 feet of the vent rim. While the actual lava lake is not visible from safe viewing areas, its glow—the diffusion of incandescent lava light within the gas plume rising from the vent—is spectacular and easily observed from Hawai‘i Volcanoes National Park overlooks on clear nights. When the lava lake level is especially high, park visitors can sometimes hear sharp sounds as rocks in the vent wall expand and crack due to the increased heat. Jaggar Museum and the overlook are wheelchair- and stroller-accessible. Other vantage points for viewing Halema‘uma‘u within the park include Kīlauea Overlook, Kīlauea Iki Overlook, and Keanakako‘i Overlook. The summit eruption, Kīlauea’s second longest since the early 1900s, can also be experienced through photos, videos, and webcam images posted on HVO’s website (http://hvo.wr.usgs.gov). A USGS Fact Sheet about this ongoing eruption is currently in press, and will be available online in the coming months. 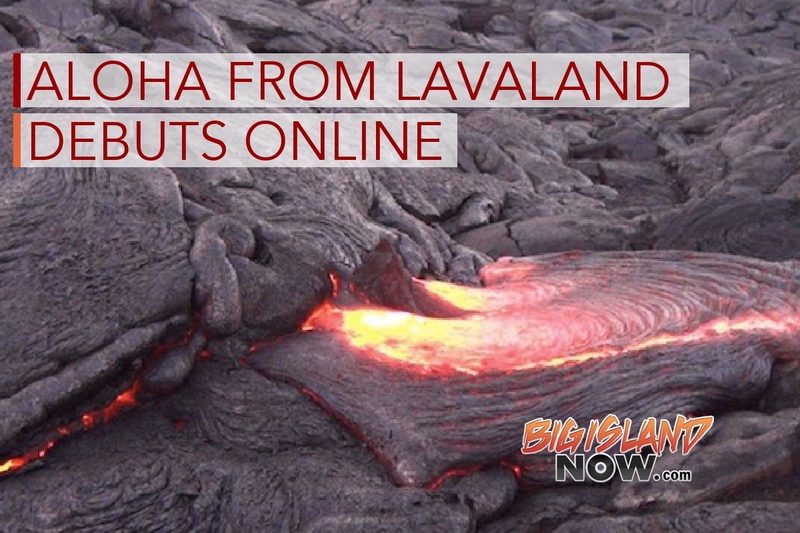 Several streams of lava were entering the water near Kupapa`u Point. Here at the eastern end of the ocean entry a narrow stream is battered by the surf. Breakouts near the shoreline have diminished over the past week, but surface flows remain active closer to the base of the pali on the coastal plain. The lava lake within Halema‘uma‘u Crater at Kīlauea is tantalizing visitors and park staff as it continues its current trend of repetitive rising and falling, attracting many to the best vantage point: the overlook at Jaggar Museum. Scientists at the U.S. Geological Survey’s Hawaiian Volcano Observatory report that the lava lake rose to levels approximately 125 feet or less beneath the crater floor this morning, and HVO webcams today suggest the lake rose even higher, before sinking again this afternoon. 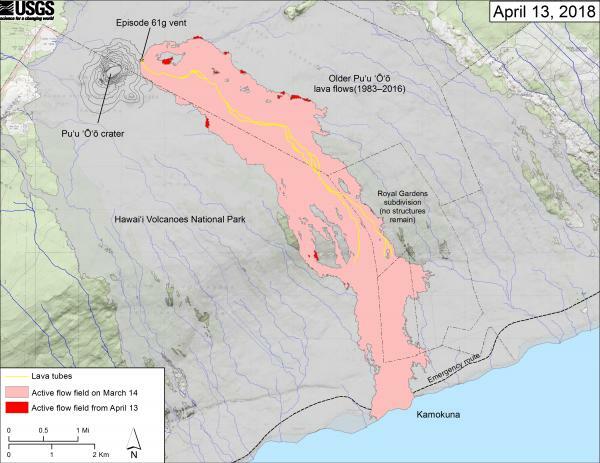 Dr. Jim Kauahikaua, HVO’s Scientist-in-Charge, says the lava lake will be visible from the overlook at Jaggar Museum if it comes within about 65 feet of the crater floor. The lava lake reached its highest level today since forming after an explosive eruption on March 19, 2008. Meanwhile, rangers urge park visitors to obey traffic signs and to be safe. Visitors are gathering at park overlooks after dark to view the dramatic glow that lava beneath the surface casts upon clouds and the plume of volcanic gas, hoping molten lava will rise high enough to be seen. The parking lot at Jaggar Museum is busy with hopeful observers, who are reminded to park only in marked stalls and heed all signs. All visitors who plan to come after dark are urged to bring flashlights, especially those who park at Kīlauea Overlook, which affords panoramic views of the crater and Kīlauea caldera. Earth cracks, rocks, and other hazards are not easily seen in the dark. In addition, several pairs of nēnē, the federally endangered Hawaiian goose, are beginning to nest near the Jaggar Museum parking lot, and are sometimes spotted along roadsides and trails. Cars are the leading cause of nēnē fatalities, and drivers are cautioned to be alert, and to drive the speed limit. “Safety is our number one priority,” said Park Superintendent Cindy Orlando. “We encourage everyone to visit during this fascinating episode, but to exercise caution. Staff will be assisting visitors with parking and interpretation of the current activities. If people come prepared and proceed as directed, they should have an unforgettable experience,” she said. Hawai‘i Volcanoes National Park is open 24 hours a day. For more information, visit www.nps.gov/havo. 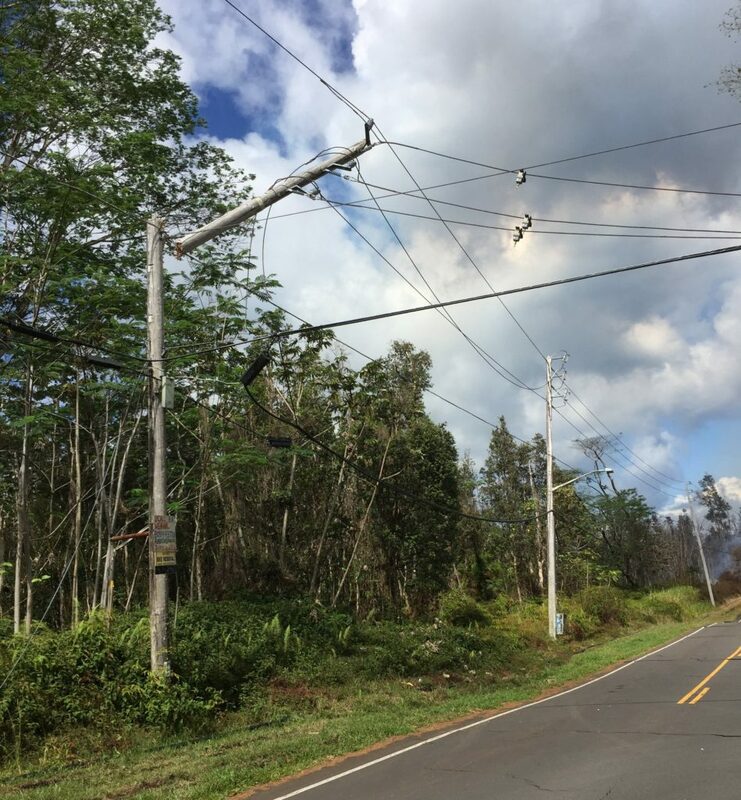 For webcams and daily Kīlauea status updates, visit the USGS HVO website, http://hvo.wr.usgs.gov/activity/kilaueastatus.php. Kilauea Explosion Cloud, 1924. Photo Courtesy of the National Parks Services.